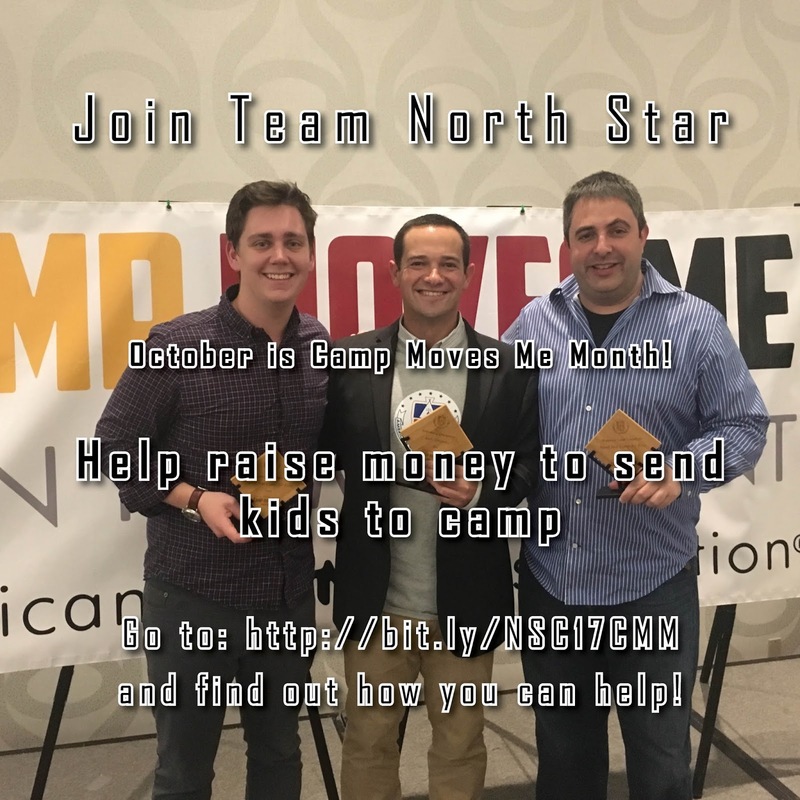 Join Team North Star and help raise money to send kids to camp! October 2017 marks the 4th annual Camp Moves Me. Camp Moves Me is an effort on the part of the American Camp Association to get people moving and get kids in need to camp. And for year #4, we need your help to make sure that North Star stays on top as Camp Champion! Camps from all over the US and Canada participate in Camp Moves Me, and as three time Camp Champion, North Star has raised more than any other camp each year. In 2016, Team North Star participants helped us gather 168 pledges, raising $14,835. Here's how Camp Moves Me works... Participants have to run, walk, bike or do other physical activity throughout the month of October. Upon creating their registration page, they commit to do a specific amount of physical activity over the course of the month. They they ask their family and friends to support them by pledging a donation based on the amount of activity that they do! So if you're already a regular runner, walker, biker or do other regular exercise, join in and see that activity help get kids to camp! 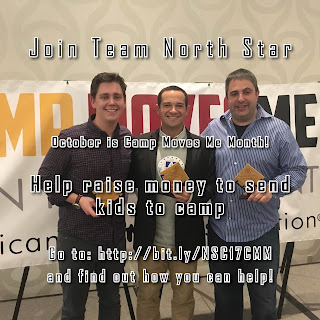 Once again, money raised by Team North Star will go to the Camp for All Kids Foundation, which helps send kids from underserved communities to North Star as well as Camp Birch Trail, Chippewa Ranch Camp, Camp Kamaji and Camp Timberlane. The Camp for All Kids Foundation has been North Star's scholarship fund for many years and we're excited to see the organization benefited this year. We need your help to see North Star remain the Camp Champion in 2017! Any and all campers, staff, alumni and family members can join by going to the Team North Star Page. Then reach out to all of your friends, family and co-workers to have them pledge to support you. You can also donate directly to support Team North Star if you aren't able to participate by clicking the green "Contribute" button on our team page. Camp Parents, please help us by telling your camper about Camp Moves Me and encourage them to help give the gift of camp that they've been so lucky to be a part of! Our staff have been busy since leaving camp a few weeks ago. Read below to see what your favorite staff members from the summer will be up to during the upcoming year! Ben Meyer - starting his senior year and Windward High School in Los Angeles. At school, Ben is on the tennis team and is involved in the investment club, film club and the psychology club. Micah Jona - beginning his freshman year at University of Wisconsin - Madison where he is studying computer science and business. At school, Micah is joining Brody’s euchre club and looking forward to becoming a Badger sports fan. The J-1 exchange visa has allowed us to bring International Staff to North Star and make camp a more well rounded community. We've learned that the Trump Administration is considering executive action to reduce or eliminate the program. Please take some time to read more about the J-1, its importance to camp and what you can do to help preserve it. A quick warning before we get started...this isn't a typical Siren entry. It may get a bit serious and even a touch political, but it is really important... and we need your help, too. So please read on and stick with me! Whether you're a camper, staff, alumnus or camp parent, you know the importance in having a great camp staff! Putting together the best team possible cannot be understated and it is the most important thing that Andy and I do. A camp can have an amazing philosophy, impactful policies and safety procedures that leave no stone unturned, but without the right men and women to execute that stuff, they're just words on paper and ideas in someone's head. And if you've spent any time talking with Andy or I, you know that we take our hiring process very seriously. It starts with our Counselors in Training program. Moving from camper to counselor at North Star is neither a given nor a rite of passage. We've known some of our prospective CITs for eight years, but they still go through an application and interview process to make sure that they're ready to assume the role of taking responsibility of caring for our campers. Jeff McCormack runs a program that is intentional and carries on the tenants established by Lou Rosenblum and Jack Weiner. Staff members are not guaranteed to return, either. Every counselor completes a reapplication and then has a re-interview with Andy or me... each and every off season. Our hiring process for new staff is as comprehensive as you'll find. It starts with finding the right people. Sometimes we're lucky and applicants find us as they search the internet for a camp job. For most of our staff, however, we cast a wide net. 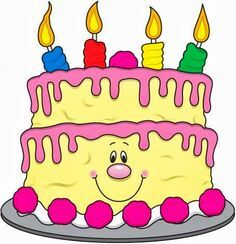 This means posting to countless sites that will connect us with prospective staff. It also means traveling... a lot! In a typical hiring season we'll visit up to 20 college campuses to attend hiring fairs or just set up a table in a student union or campus rec center. There is nowhere we won't go to find the best counselors and support staff. And once we have the applicants, our hiring process involves interviews with Andy and I (assuming they make it through the first interview). It's better to put in an extensive effort in February, March and April than to be trying to correct the wrong hire in June, July or August. So what are we looking for in our staff? Beyond having the empathy to work well with kids and the work ethic that it takes to complete eight weeks of camp, there are lots of different attributes that make great staff. In reality, there is no one profile that we look for. We see our staff as a puzzle. We need a wide variety of people to put together a complete staff. We need different personality types as well as a host of other attributes. Diversity is a key in many different ways. With a wide variety of campers, we want a variety of staff who can meet their needs. We also want to expose our campers to a host of different folks with different backgrounds and stories. This gets us to the topic at hand, International staff members. Our International staff members play a fundamentally important role at camp. They are a major part of the diversity of our camp. They bring different traditions, background and world views. They open our campers eyes to a world that exists beyond their front door. Having counselors from Europe, Africa, Australia (and more) have undoubtedly made North Star a more complete community. Those who joined us at post camp last week saw this in full force as Manfred Frank, one of our first International staff members (beginning his NSC career in the 1970s) came all the way from Germany to spend the week at camp. He not only resumed friendships with those he knew, he built new friendships, too. For people like Manfred and others, those relationships are ongoing and show the true reach of North Star. So here is where we may get a bit political and I ask for your help. In April of this year, President Trump issued the "Buy American and Hire American" executive order. There has been some question about what that executive order would target, but as this article in Monday's Wall Street Journal indicates, there is some indication that the Trump Administration is targeting some of the J-1 visa exchange programs. The J-1 covers a few programs, among them is the Camp Counselor program as well as the Summer Work Travel program (which brings support staff to the US). Both of these programs are ones that North Star uses to bring staff members to the US. There is real concern that both programs will either see their numbers reduced significantly or eliminated all together. There are lots of reasons why these programs are important and the benefits for our campers, staff and community have been tremendous. If you haven't been fortunate enough to spend time at camp with our staff members from abroad, take a few minutes to talk to someone who has. No doubt you'll hear great stories about having a trip leader from Calcutta, a sailing instructor from Edinburgh or a co-counselor from Dublin. Just as important is what North Star has given those staff to take back home as we've seen the North Star ripple effect truly go global. From what we are now hearing, however, both from executives at the American Camp Association as well as from the agencies that sponsor the visas, the threat to the J-1 is real. Some believe that executive action may be coming within the next ten days. And that's why we need your help. We urge you to reach out to those who are a part of this decision. This page will allow you to reach out to the Trump Administration as well as your Senators and Congressmen. Action that may eliminate the J-1 will likely be in the form of an Executive Order, so if you know of anyone within the current administration (or anyone that has a connection within the administration) please reach out to them. For decades we've had staff from across the globe come to North Star, help make our community a more well rounded place, and take the values of North Star back home with them. Please help make sure that this amazing tradition can continue for generations of campers and staff!